Have fun in your garage with a random orbital buffer! So you finally bit the bullet and purchased a Griot’s Garage 6 inch Random Orbital Polisher? Congratulations, the quality of life...err…detailing just went up! You will absolutely LOVE how easy it is to polish and wax your car using this versatile, lightweight random orbital dual action polisher. There’s only one problem: you find yourself overwhelmed by the dizzying array of foam and microfiber pads available from Griot’s Garage for this tool. Have no fear, because Autogeek is here with our exclusive Griot’s Garage Random Orbital Buffing Pad Guide! Right out of the box the Griot’s Garage 6 inch Random Orbital Polisher includes a 6 inch hook and loop backing plate. 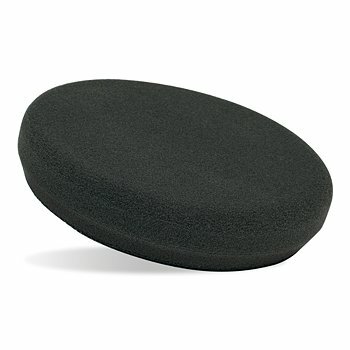 This backing plate is designed to accommodate 6.5 inch foam and microfiber pads. Before you read any further, please note that in order to use a 5.5 inch pad on your 6 inch Random Orbital Polisher, you will need to purchase a 5 inch Dual Action Backing Plate. For small, intricate panels like pillars and bumpers, pick up a Griot’s Garage 3 inch Random Orbital Polisher. You’ll never look back! Griot's Garage foam and microfiber pads are constructed using the highest quality materials for a long operating life. If you’re still overwhelmed at this point, don’t give up yet! Trying to determine the size of the pads that are perfect for your application is simple. First and foremost, if you drive a large truck, SUV or van, then 6.5 inch pads are ideal. If you drive a car, small truck, or compact SUV, then you will be much happier with 5.5 inch pads. It’s worth noting that a 6.5 inch pad is perfect for the hood and roof of most vehicles, regardless of their size, so if you have a small car or SUV it would be worth picking up a couple 6.5 inch pads just for these panels. Griot’s Garage Foam Pads utilize thermo-set bonding of the foam to the hook and loop, ensuring a heat and chemical proof bond for long life and machine washability. The premium loop attachment features durable nylon loop for long-lasting attachment to the backing plate and easy removal when you’re finished. When it come to machine polishing, Griot's Garage Orange Foam Correcting Pad is built for speed. The dense orange foam keeps polishes on top of the foam to reduce waste. 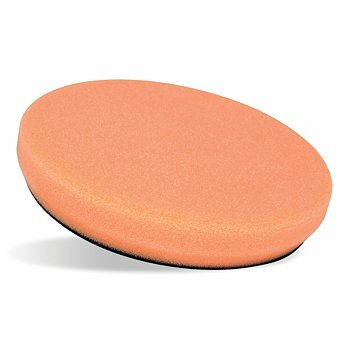 Get the shine you want faster with Griot's Garage 6 Inch Orange Foam Correcting Pad and a 3 inch or 6 inch orbital polisher. Griot’s Garage Black Foam Finishing Pads are perfect for applying a finishing polish or glaze to a dark colored vehicle. Griot’s Garage Black Foam Finishing Pads are designed to leave a flawless finish on finicky paint systems. Griot's Garage Red Foam Waxing Pad applies a thin, even coat of wax to create a uniform shine. 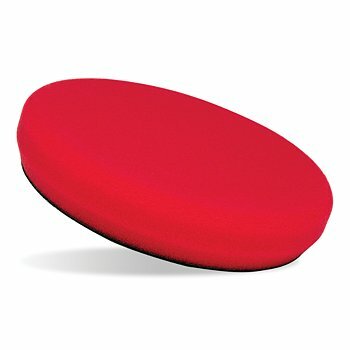 The nonabrasive red foam keeps wax on the surface of the pad so none is wasted. Use Griot's Garage Red Foam Waxing Pad with your 3 inch or 6 inch Orbital Polisher for fast, smooth wax application. What’s the difference between foam and microfiber pads? If your vehicle's paint suffers from deeper swirls and scratches, then microfiber pads are perfect. If you have light swirl marks or just want to polish and wax your car, then look no further than foam pads. Microfiber pads are more aggressive because each individual fiber acts as an abrasive that engages the compound or polish that you’re using, thus increasing cut and rate of defect removal. 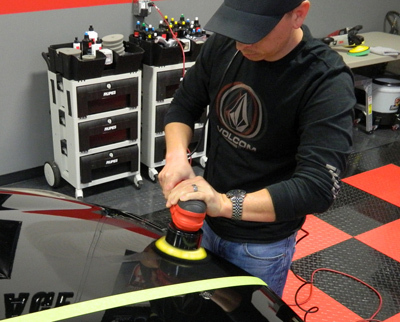 For a true show car finish, always use a black foam pad after a microfiber pad to remove any hazing that may have been created during the first step. Designed to be used with a medium or light cut polish, Griot’s Garage Micro Fiber FAST Finishing Pads deliver a flawless, swirl-free finish on all paint systems. The thick foam interface conforms to the surface of your car, increasing pad contact to ensure a uniform finish. Use with your Griot’s Garage Random Orbital Polisher. Griot's Garage foam and microfiber pads need to be properly cared for to ensure maximum operating life. Clean your pad often with a Foam Pad Conditioning Brush to remove spent polish, oxidized paint and other embedded contaminants that were removed from the paint during the polishing process. When you’re finished using the pads for the day, soak them in a bucket of warm water and mix in one ounce of Detailer’s Polishing Pad Rejuvenator. This citrus-based degreaser removes caked on polish and wax residue, leaving your pads clean and ready for future polishing sessions. After they’ve soaked for 15 to 20 minutes, thoroughly rinse them out and allow them to air dry in a well ventilated area with the backing material facing up. Now that you're an expert on foam and microfiber pads, go out and have fun in your garage!